Local networks are now being flooded with political campaign advertisements, presidential aspirants have begun to promise that they will build bridges on non-existent rivers just to win the votes of the masses. Meanwhile, avid supporters have spilled out on the streets to boost their candidate’s morale and spates of screaming headlines and mudslinging against presidential candidates have now hit the newspapers. Truly, we are at the cusp of yet another colorful and theatrical national elections in the Philippines. However, unlike the previous elections, experts say that the social media is going to impact the rules of the electoral game and ultimately shape the 2016 polls. Philippines, a developing country known for its culture of “friends helping friends”, is the social media capital of the world. According to a research by Vulcan Post Malaysia, most Filipinos use social media to stay in touch with friends and families, to keep company, to share new experiences, to have fun, and to meet new people. And because of the type of culture the Philippines has, it is not surprising that the country has become a hotbed for social media. As social media continues to rapidly grow in the country, it has become one of the tools used by politicians to promote themselves during political elections. According to COMELEC, around 53 to 54 million voters will troop to the precinct next year and a huge number of these voters are active on social media. In fact, in a study published by We Are Social Singapore in March 2015, 42 million Filipinos are said to be active social media users while a total of 36 million Filipinos are active mobile social users. The study also noted that Filipinos who are active on social media spend an average of four hours and fifteen minutes on social media websites per day. The social-media savviness of Filipinos has made it easier to disseminate news and information, making it a double-edged sword for candidates who are vying for elective posts in the government. Two weeks ago, the filing of the certification of candidacy for elective posts has concluded. 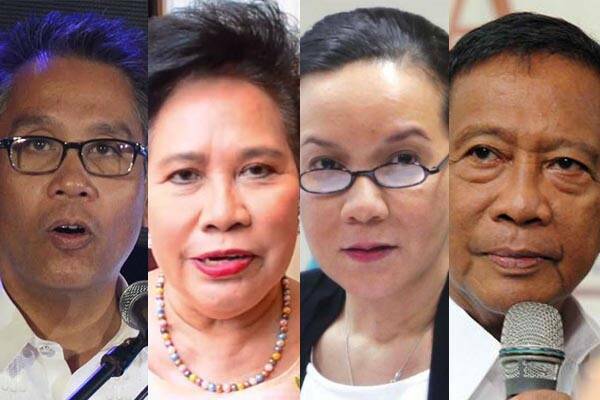 For the presidency, four names are deemed to be the front-runners: current Vice President Jejomar Binay, former Department of Interior and Local Government secretary Mar Roxas, Senator Grace Poe, and Senator Miriam Defensor Santiago. The name of each of the aforementioned candidates has been ubiquitous in social media. Netizens have begun to scrutinize their moves and characters, and as a result, a single statement from these presidential contenders could either make or break their political fate. But the question is: Who among them is winning the four-way social media tug-of-war so far? Through the use of social media analytics tools such as Sysomos and Fanpage Karma, TO THE NEW Digital was able to rank these leading presidential aspirants according to their online popularity. The Liberal Party officially announced Mar Roxas as its presidential candidate for the 2016 national elections on Friday, July 31. The official hashtag used during the announcement of his candidacy was #RoxasNa. Meanwhile, frontrunner Grace Poe announced her candidacy last September 16. The hashtag used for her announcement was #Poe2016. Miriam Defensor Santiago shocked the country with her surprise announcement last week, October 13 during a meet and greet for her book, “Stupid is Forevermore.” Her staff was seen wearing #Miriam2016 shirts and was thus used by her fans online to support her candidacy. Using Sysomos, a social media monitoring tool, we were able to garner the total number of mentions each of these hashtags generated. We tracked the usage of these hashtags for four whole days from the day of their presidential announcement. (Note: Sysomos does not track Facebook mentions. Also, we did not include Vice President Jejomar Binay in the data since he announced that he will be gunning for the presidency way back in 2010). Miriam Defensor Santiago proved her social media rockstar status by leading the pack with 54,587 #Miriam2016 mentions. Not far behind was Social Weather Station-survey front runner Grace Poe’s #Poe2016 hashtag with 45,781 mentions. 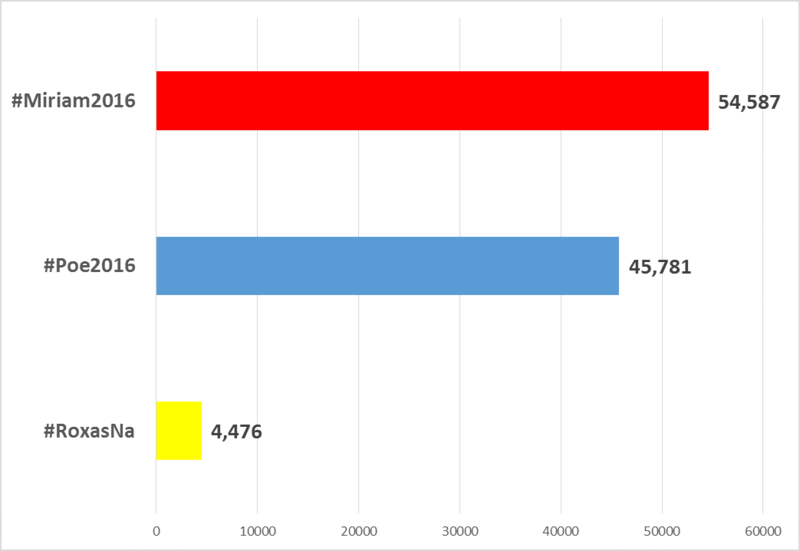 Meanwhile, Mar Roxas lagged way behind the other two candidates; the #RoxasNa hashtag used to promote his presidential bid announcement only garnered a total of 4,476 mentions. For all these three presidential candidates, the highest spike for the mentions of their names occurred on the day of their presidential bid announcement. Roxas garnered a total of 8, 727 mentions (+63% vs previous day), Poe received the highest spike with 20,255 mentions (+107% vs previous day) while Santiago received 15,416 mentions (+86% vs previous day). Miriam Defensor Santiago’s official Facebook page had the most number of followers with 3.1 million likes. She also beat the other candidates’ pages in terms of post likes and post shares. Meanwhile, Jojo Binay’s page’s comments sections were the most active during the said time-frame with 152,000 comments. He also had the highest overall engagement among the candidates, but this does not necessarily mean that he is at the helm of the social media influence battle since the sentiment of comments on his page varies. Grace Poe and Mar Roxas need to work on their online popularity for the numbers show that they are trailing behind other front-runners – especially the former, since her page only has 628K likes. Also, since Poe is leading SWS survey, a boost on her online presence and influence could even strengthen and further stretch her lead against other candidates. Also shown below is the search trend of the candidates’ name on Google – the apex of all search engines. From August 1 to October 21, Grace Poe received the most search hits on Google. Coming second were Mar Roxas and Miriam Defensor Santiago. However between the two, Santiago’s performance on Google can be seen as impressive (especially compared to Roxas who was almost “omnipresent” in all forms media) since she was out of the scene for months. Meanwhile, despite countless of corruption against him and his family Binay was the least-searched candidate on Google. After all, fools rush in where angels fear to tread. It has become very important to measure the ROI from social media during such landmark event like #Elections2016. But, how to do it? TOP 5 reasons why Online Streaming is the next big thing in India!